The Society’s aim since 1954 is to promote the study and appreciation of the life, works and times – not only of Arnold Bennett himself – but also of other provincial writers, with particular relationship to North Staffordshire. Please click on the Books link above for further details. Also details on how to purchase copies of our Conference Papers. Dr Randi Saloman – Wake Forest College, Winston Salem, NC. U.S.A.
Denis Eldin is Arnold Bennett’s grand-son and lives in Paris. He is a frequent visitor to Stoke on Trent. This picture was taken at the 2016 annual dinner, held at Port Vale Football Club Banqueting Suite. 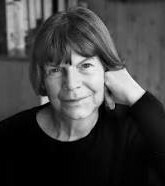 Dame Margaret Drabble, Lady Holroyd DBE FRSL. Margaret is a novelist, biographer and critic. She is the author of “Arnold Bennett a biography“. Jacques is Arnold Bennett’s son-in-law and was married to Virginia, his only daughter. This picture was taken when a plaque was unveiled at Villa les Nefliers, Fontainebleau, France, the home of Arnold Bennett while he was writing The Old Wives’ Tale. 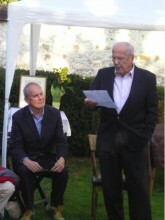 The picture features Jacques in the garden with Gyles Brandreth. 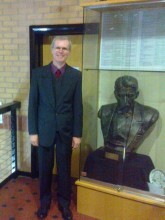 Professor Ray Johnson was the Film Heritage and Documentary Professor at Staffordshire University prior to retiring in 2014. Founder of the Staffordshire Film Archive in 1980. 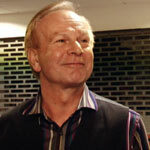 Ray was awarded the MBE in 2011. John Shapcott is an Honorary Research Fellow, at the Research Institute for the Humanities at Keele University, and is an ex chairman of the Society.